For those of you not particularly excited by an all heavy metal music game, we have The Killers, who will be debuting songs off of their new album Day & Age in Guitar Hero World Tour day and date with the album's release on November 25th. What genre would you consider The Killers anyway? I'd say alternative, but I am pretty sure there was no alternative throughout all of last year to hearing "Mr. Brightsides" and "When You Were Young" every time you turned around. Well at least we're getting something new from them. The three song track pack includes two titles off the new album, "Human" and "Losing Touch", along with "Mr. Brightsides", dammit. The pack will run you 440 points via Xbox Live or $5.49 on the PlayStation 3. All three songs will also be available as solo downloads for 160 MS Points, $1.99 PS3, and on the Nintendo Wii for 200 points a pop. Don't complain to me about the cost. It's just the price I pay. Destiny is calling me, so open up your eager eyes to check out the press release after the jump.THE KILLERS TO DEBUT NEW MUSIC AS DOWNLOADABLE CONTENT FOR GUITAR HERO® WORLD TOUR Three Song Track Pack Available Day and Date with The Killers’ New Album, Day & Age SANTA MONICA, CA – November 14, 2008 – After making their entry in a Guitar Hero® set list with “When You Were Young” on Guitar Hero® III: Legends of Rock, multi-platinum alternative rockers The Killers are playing a downloadable encore in Activision Publishing, Inc.’s (Nasdaq: ATVI) Guitar Hero® World Tour, the company announced today. 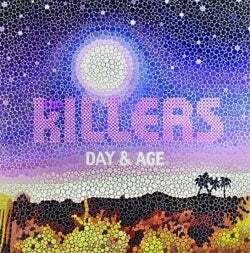 To celebrate the release of the band’s third album, Day & Age, The Killers downloadable content will be available simultaneously with the album’s release on November 25th and will feature two singles off Day & Age: “Human” and “Losing Touch.” Rounding out the Track Pack and adding to the killer experience is the GRAMMY® nominated smash hit “Mr. Brightside” from the band’s debut album Hot Fuss. The Killers Track Pack will be available on Xbox LIVE® Marketplace for the Xbox 360® video game and entertainment system from Microsoft for 440 Microsoft Points and on the PLAYSTATION®Store for the PLAYSTATION®3 computer entertainment system for $5.49. In addition, ”Human,” “Losing Touch” and “Mr. Brightside” will be released as single downloadable songs for Xbox 360 for 160 Microsoft Points, PLAYSTATION 3 system for $1.99 and Nintendo® Wi-Fi Connection for Wii™ for 200 Wii Points. Guitar Hero World Tour transforms music gaming by expanding Guitar Hero’s signature guitar gameplay into a cooperative band experience that combines the most advanced wireless controllers with new revolutionary online* and offline gameplay modes including Band Career and 8-player “Battle of the Bands,” which allows two full bands to compete head-to-head online. The game features a slick newly redesigned guitar controller, drum kit controller and a wired microphone, as well as an innovative Music Studio music creator that lets players compose, record, edit and share their own rock ‘n’ roll anthems. Music creators are also able to share their recordings with their friends online through GHTunesSM where other gamers can download and play an endless supply of unique creations. Guitar Hero World Tour is now available for the Xbox 360 video game and entertainment system from Microsoft, PLAYSTATION 3 computer entertainment system, the Wii home video game system from Nintendo and the PlayStation®2 computer entertainment system. The game is rated “T” for Teen by the ESRB. For more information on Guitar Hero World Tour, please visit worldtour.guitarhero.com.